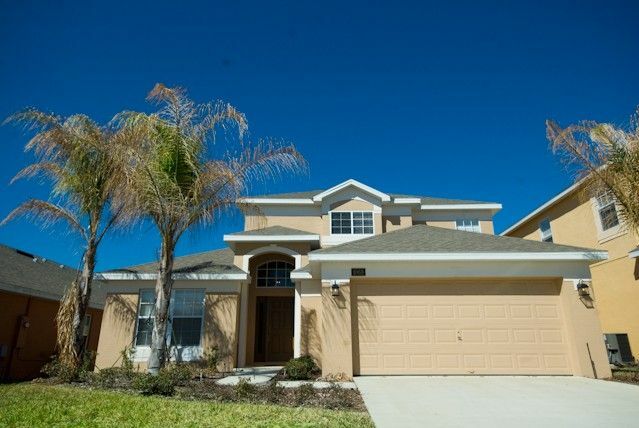 Spacious 5* contemporary styled private villa 20 minutes from Disney. Spacious spectacular villa within the gated community of WATERSONG. A peaceful retreat with woodlands and lakes, abundant with natural flora and fauna . Yet with easy access to all that Orlando has to offer, including Disney, a 20-30 minute drive away. * Master bedroom (king bed) with en-suite bathroom. *Guest bedroom (queen bed) with en-suite bathroom. * 2 further twin bedrooms - one with Disney theme. * Family and formal lounge areas. * Fully equipped kitchen/breakfast room. * Furnished to a very high standard. * Upgraded tile in living areas, carpet in bedrooms. * Games Room with full size slate bed pool table and basketball game. * Huge private southwest facing pool with extended deck and lake & conservation views. 24hr monitored alarm system with security cameras. Free use of baby equipment - pushchair, cot with bedding, highchair and stairgate. Beach chairs, towels and cooler boxes for trips to the beach. Free local & International calls to landlines. Short walk to community clubhouse. * Gated Community. 24/7 gated and manned. * Heated pool and spa. GOLF DETAILS: Discounts available at the neighbouring Providence Golf Club. This 18-hole championship course, designed by renowned architect Mike Dasher, will test your game and soothe your senses as it winds its way through land featuring fresh water creeks, ancient hardwood's and wetlands. Other nearby courses include... Champions Gate ( 2 courses ), Southern Dunes, Highlands Reserve and Walt Disney World ( 6 courses). Outdoor shower (hot & cold water) by pool. towels for beach/pool use also provided. games room with full size pool table & basketball game. Childrens toys and toddlers slide. Adult & children's bikes. 2 lounges, one with TV. Also a dining area in kitchen seating 4 at table and 2 bar stools at counter. Nearest Golf Club is Providence - right next door! Southwest facing. Not overlooked. 30 x 15 minimum. depth 3ft to 5ft. Extended pool deck. Heat available at extra cost. walk in pool. max depth 3ft 9 inches large hot tub. Huge upgraded pool 30ft x 15ft. 3ft to 5ft deep. A perfect place to relax after a day at the parks. Extended pool deck. Safety fence around pool, alarm on doors. Pool heat available. 4 loungers, dining table and 6 chairs by pool. Covered Lanai. Lovely views and sunsets from pool area. Not overlooked to rear of the property. Televisions in 3 bedrooms. Fans in all bedrooms. Upgraded kitchen with maple cabinets and Corian work surfaces. American style fridge freezer. Separate utility room . Sofa bed in second lounge adjacent to ground floor shower room. CD player/radio in second lounge area. Formal dining area seating 6. Nook in kitchen with table and chairs seating 4 and 2 bar stools at breakfast bar. Wi fi available. 42 inch T.V. and DVD player in main lounge. Selection of DVD's , books and games. CD player/radio. Towels, tea towels and bed linen supplied. Beach towels provided. Cooler box provided 2 Beach chairs. Wonderful home for a multigenerational family Disney vacation. We have rented dozens of homes thru VRBO in the Disney area. This home was the cleanest, best equipped for families, and organized of them all. It is large enough for 6 with toddlers. The furniture is comfortable. The pool is large and warm. The location is near everything but removed the commotion. The home is located in the Watersong community. 24 hour guarded gate. Very very quiet, no traffic in front of the house. We already plan to return next year. This is a terrific choice if you’re looking for a house near the parks that is safe, comfortable, quiet and a pleasure to stay in. The owner is very easy to communicate with and very gracious. We are so pleased you’ve enjoyed staying at Disney Dream Villa. It’s important to us that our guest feel ‘at home’ and have great memories of their vacation. We look forward to seeing you again. Beautiful property backing on a conservation area . It had all of the expected amenities which we enjoyed immensely. It was just as described by the owners. Will definitely try and book again when we go back. A welcoming and homely rental with everything you could want of a holiday home. Set in beautiful and secure gated community with 24 hours security personnel. Villa was extremely clean and presented to a very high standard. Pool area was clean and well equipped with uninterrupted views to the countryside. A small issue with replacing backup battery to a fire alarm was attended to immediately and cheerfully by the management company. The only minor criticism I would have is the lighting levels in the lounge and bedroom areas but this was a very minor point for us and did not spoil our vacation. Communication with the owner was clear and questions were responded to promptly. We would gladly return to this property in the future. Thoroughly enjoyed our stay in the villa. The accommodation was flexible enough to allow my family space when needed or to sit together. Many thanks. I cannot say enough positive things about our stay at Denise's vacation villa in Watersong. I loved the layout of the home. The kitchen was stocked to cook meals if one chooses to do so. The pool was clear and warm. Plenty of nice lounging chairs out by the pool to relax on. Kitchen was nicely stocked and even had a few extra supplies so you weren't instantly running out to buy dishwasher soap, hand soap, papertowels etc. I also appreciate the use of the bicycle in the garage. My husband and I would take a couple of walks a day, my daughter would tag along on the bike. The home security system is a comfort. The back sliding glass door also has additional locks on it. Home is very spacious and had plenty of room. I would definitely stay here again if the opportunity arises. Denise was easy and pleasant to work with. Even being several hours time difference apart she always responded to emails promptly. Disney World - 15 minutes. Seaworld, Aquatica & Discovery Cove - 20 minutes. Universal/Islands of Adventure & Citywalk - 30 minutes. Busch Gardens, Tampa Bay - 50 - 60 minutes. Cocoa Beach - Atlantic Coast - 60 - 70 minutes. Clearwater / St. Pete's Beach - Gulf Coast - 60 -70 minutes. For the shopping enthusiast the nearest large mall is Premium Outlets - 20 minutes. Many others within a 30 minute drive, including The Florida Mall and Millenia. The '192' with its many attractions including shows, restaurants, shopping etc is 15 minutes by car. For everyday shopping needs, a brand new supermarket has just been built nearby. Restaurants are abundant , many within a few minutes drive. DEPOSIT IS £100. POOL HEATING AVAILABLE (REOMMENDED BETWEEN OCT AND APRIL) .COST IS £130 PER WEEK. DISCOUNT AVAILABLE FOR STAYS OF 3 WEEKS OR MORE. LATE DEALS AVAILABLE. WE CAN ARRANGE FOR A GROCERY PACK FOR ARRIVAL.